In Rockville, Maryland there's an excellent Cuban restaurant called "Cuban Corner." As far as my palate is concerned, and as I've stated before, this is the best and most authentic Cuban restaurant in the Greater Washington, DC area. They are at 825 Hungerford Drive, near Ivy League Lane, Rockville, MD, 301-279-0310. Essentially on a strip mall right on Rockville Pike. The food is authentic, affordable and plentiful (see the menu here). My favorite dish there is "Ropa Vieja," although the "Vaca Frita" is also superb. Either of those dishes, with a side of yuca con mojo or tostones, will delight your mouth and belly. There's something special that happens when yucca and lime and garlic marry. "Ropa Vieja", as Cuban Jews will often tell you, has an interesting tie to Cuba's considerable (and often ignored) Jewish history. 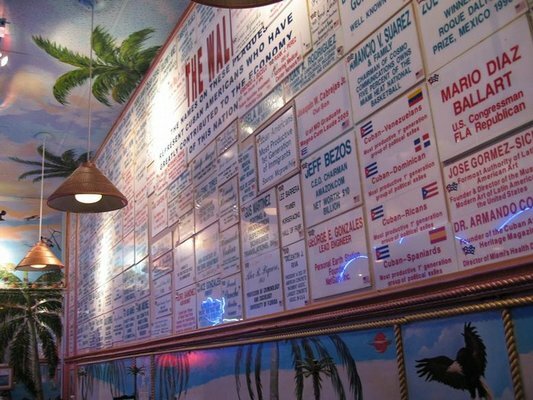 A visit to Cuban corner also delivers the interesting spectacle of the restaurant's Cuban Hall of Fame... or as they call it: The Wall. The Cuban Hall of Fame, as determined by Joaquin Cabrejas, the restaurant's feisty owner, is composed of Cubans, Cuban-Americans, and people of traceable Cuban ancestry, and is made up of hundreds of name plaques glued to the restaurant's walls. - Angela Anais Juana Antolina Rosa Edelmira Nin y Culmell - otherwise known as Anais Nin, one of the 20th century's sexual goddesses nymphomaniacs (and a damned good writer as well!). - Amazon's creator Jeff Bezos. - Benjamin Huberman, Science Adviser to several American presidents. - Truman Capote (by adoption)... took the last name of his adopted dad. Capote in Spanish is a large cape or the hood of a car. - Ysrael A. Seinuk, the "father of the modern New York skyline." - Eamon de Valera: The father of the modern Irish republic was Eamon de Valera, who was born in New York in 1882. His father, Juan de Valera, although technically on paper always reported as a Spaniard, was really a Cuban, born in Cuba (which was part of Spain back then), the son of a Cuban sugar planter and escaped to New York during the Independence Wars with Spain. There he earned his living as a piano teacher. He met and married Irish immigrant Catherine Coll. Juan died shortly after the birth of their son Eduardo. After Juan's death, his wife sent Eduardo to Ireland, where her family changed his name to the Gaelic version of Eduardo: Eamon. - Cameron Diaz... we all know who she is. - Dr. Steve Pieczenik, author of 39 books, including 16 bestsellers. He is critically acclaimed author of psycho-political thrillers and the co-creator of the New York Times best-selling "Tom Clancy's Op-Center" and "Tom Clancy's Net Force" book series. He is also one of the world's most experienced international crisis managers and hostage negotiators. - Olga Viso, the Hirshhorn Museum's former director and now director of the Walker Art Center. - The Joker... I mean Cesar Romero. Ambrosio José Gonzales, this Cuban Confederate Colonel played a significant role in the Civil War and was essentially responsible for building Confederate coastal defenses. He had his finest hour during the Civil War as the artillery commander at the Battle of Honey Hill. Cubanos todos de alguna manera!